Independent travel is not permitted in Bhutan. 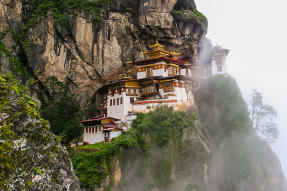 Visitors are required to book travel through a registered tour operator in Bhutan. This may be done directly or through a travel agent abroad. You may check Association of Bhutanese Tour Operators for information on accredited tour operators. Further information may be obtained through the Bhutanese Department of Tourism, PO Box 126, Thimphu, Bhutan. A non-negotiable daily tariff is set by the Bhutanese Department of Tourism, which includes all accommodations, all meals, transportation, services of licensed guides and porters, and cultural programs. The rate is the same for both cultural tours and treks. Travelers should contact the Department of Tourism for the latest daily tariff. Entry by air is available only via India, Bangladesh, Nepal, Thailand, and Singapore. The border with China is closed. At this time, only the Bhutanese government airline Drukair and the commercial Bhutan Airlines services Bhutan. More information on the airline is available at http://www.drukair.com.bt/. Both airlines will only board travelers with visa clearance from the Tourism Authority of Bhutan. Airline tickets cannot be purchased without a visa clearance. A passport valid for at least 6 months and visa are required for entry into and exit from Bhutan. Visa and clearance applications are available from selected travel agencies; visas are granted for the scheduled travel period. Most visitors, including those on official U.S. government business, should obtain visas prior to entering the country. Upon arrival, a visa stamp will be affixed on your passport after payment of USD $40. You would also need to present two passport photos. For additional and current entry/exit information, please contact the Tourism Council of Bhutan.